Simone Lavizzari had a strong background in cutting-edge tech when he decided to undertake an Executive MBA program. With a master’s degree in electronics engineering and a PhD in electronics and information technology, he felt an EMBA was necessary to develop his overall business knowledge and soft skills. Flexibility was key to Simone’s choice of program however, as he wanted to continue working and not be tied to one city or location. This made the International Flex EMBA at MIP Politecnico Di Milano stand out. The 20-month EMBA program uses one of the most advanced digital platforms in the world, developed with Microsoft, and is aimed at those looking to combine study with work. It’s designed to be completed at the convenience of the student rather than on a set schedule. Over 90% of the course is delivered digitally, with only one on-campus week in Milan and one in London. For Simone, who was working in Belgium for Imec—a world-leading research and innovation hub in digital technologies—this was ideal. The program’s flexibility meant he could complete it even through major life changes. “I changed both city and country without any significant impact on my EMBA,” Simone explains. “This was made possible only due to the extreme flexibility of this type of educational format. It was during the degree that Simone managed to land his current role as product marketing and innovation director at Prophesee—a Paris-based artificial intelligence startup developing machine vision technology. Prophesee, which has raised $40 million in funding in three years, develops advanced neuromorphic vision systems, teaching machines to see in a similar way to how the human eye and brain work. This machine vision paradigm is set to have wide-ranging applications in fields such as autonomous vehicles, industrial automation, the Internet of Things (IoT), security and surveillance, and augmented and virtual reality. 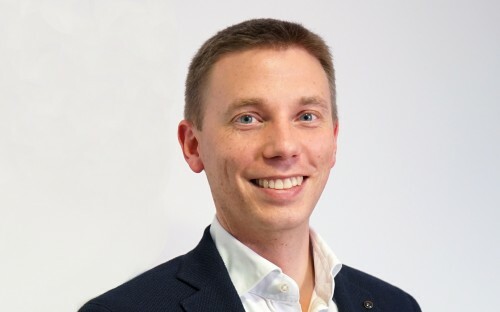 Despite the technical aspects of the job and his specialized background, Simone is convinced he couldn’t have landed the role without the International Flex EMBA. “I share the view that says that you don't need to be an expert, unless you do a very technical job, but you need to know and understand how these concepts work to make a difference in business,” he says. “I was lucky with Prophesee and was interviewed at the right time. I had the technical background, but was able to add value thanks to the EMBA, which was key. The new role was going to require a good chuck of skills and tools that I acquired on the program. With its global network and diverse cohort with a range of experience, as well as the innovative digital platform, the i-Flex EMBA provided the perfect environment for Simone to develop himself. While many assume that distance-learning is an isolated experience, Simone was in fact able to interact with his cohort and lean valuable lessons from them helping him take the next step in his career. “I could interact live with my classmates, get know them and learn from their experiences. I enjoyed the heterogeneity of the class, both in terms of country of origin and work experience. This diversity was the main reason behind my choice of the International Flex EMBA,” he adds. “The topics covered were illuminating. The soft and leadership skills in particular were directly applicable in my daily life, both at work and in a personal sense.